Land Dirt Cheap or landdirtcheap is for business home house homes land rent rental car hotel land property cheap dirt property commercial residential resort hotel motel rent lease house homes home vacation travel fishing hunting gold and gold mining coins treasure land homes coin collectibles antique hotels air flying airline lakes rivers streams trees forests parks hotel coins oil REE's elements vacation airline books guns ammo hunt ferry boat vacation resorts lodge. What can you find on land dirt cheap? Land, of course, homes, house, property, dirt, rental, for rent, for sale property, both commercial and residential, land for lease or go on a vacation. While on Vacation You may: Relax in your room; swim in the pool or soak in the Jacuzzi; have a five course dinner; go gold mining or gold prospecting or find gold and stake your own gold mining claim; go hunting or fishing; camp along the thousands of creeks or lakes or miles of beaches; go hiking, bicycling, ATV riding, trail riding or even horse back riding; go on a cruise on one of the hundreds of tour boats or sightseeing from a bush plane; go on a tour of the Wrangle, St. Elias National Park and Preserve - the largest in North America; visit abandoned villages and gold mining camps; see the Yukon River, the midnight sun, cross the Arctic Circle or visit Alaska Native Villages and Eskimo Igloos; Duffy’s Roadhouse or you may visit the hundreds of other historic places that are on the maps; and you could go to museums, plays, theatres, shopping, antique stores and pawn shops or visit Russian Orthodox Churches built over a hundred years ago or visit fishing villages where the villagers have fished for hundreds of years; and, you could even learn the meaning of the words such as “cheechako”, “sourdough” or “lower 48”. Where are these located? In the USA, Canada, Mexico, Brazil, Europe, Germany, France, Italy, Costa Rica, Peru, Spain, Washington DC, Florida, California, Arizona, and in other countries around the world. Some of the names for the claims of the Slate Creek Claims consisted of Prince Placer, Four Black Dogs, St. Anne, Fanny Bench, Fraction Bench, Naomi, Humdinger, St. Louis, Tacoma, Tiger, Big Star, Coles, Linn, Gerhard Hanson, Eureka, Hattie N. and Solomon’s Bench, to name only a few (the property consists of 2 1/2 miles up Slate Creek from the Chistochina River). 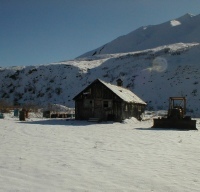 During those early years some of Slate Creek was mined with Pick-n-Shovels with some mining by Slate Creek Mining Company who was conveyed title in 1939 and later, in 1962, Louis Elmer and the Elmer family. 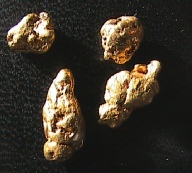 Elmer and the Elmer Family Trust allowed mining on the property by a few mining operations who each mined quantities of GOLD and other valuable deposits however much of the property has not been mined to date. 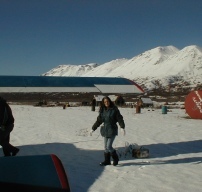 In 2007 Mac and Monica entered into a purchase agreement for this beautiful, historic parcel along with several cabins and some equipment with the intention of mining for Precious Metals and forming an Adventure by joining with MacDuffy’s Adventures to open up this Historic Mining Area to Visitors in Alaska who would truly enjoy an Adventure such as this and have named the area Yah, Alaska. It’s an Adventure you and your family will never forget! We hope to make you feel like you have went back in time to the early 1900’s leaving all the comforts of home behind—we have included some comforts that the Prospectors back then dreamed about—but didn’t have. Safety information and Conditions: Travel in remote areas can be dangerous and emergency services for accidents or illnesses may not be available. You agree to hold MacDuffy’s Adventures, it’s agents, contractors, employees and anyone offering services to you and your family harmless for any damages whatsoever. In addition, the Slana Trail is a public right of way but the property beside the Trail may be private land and a permit fee may be required to access land off the 50’ wide trail so please stay within the trail boundaries. A cancellation fee will apply once your date has been confirmed. All adventures are subject to availability and weather conditions. All prices stated in our flyers or documents are per person, subject to change and may be canceled at our discretion.